Dog Training Techniques: Do They Work on Horses Too? I’ve been playing with some new to the horse world ideas. I know, I know…so what else is new! It has been a treat this summer to have a young lady interning with me who had a fabulous coach in the dog training world. So, of course, we started to play with how to do horse things in more of a dog way. Why wouldn’t we? After all, we are out of the box thinkers to start with, so why not way out? 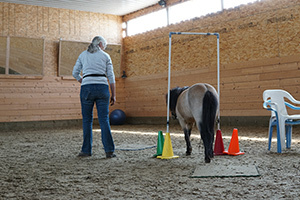 You always see the horse agility videos where the horse is fairly close to the handler. In the dog agility world there seems to be two types – the close and the far. We wanted to play with seeing if we could build distance in the work that most horse people do up close. Eggo already knew his mat work and I could send him to a mat from a fair distance so we played around with going around an object to get to his mat. We still did all the thin slicing we always do when clicker training to set him up for success. I didn’t want the look to be the one where the person just stands and gives orders about what to do. I wanted it to be more of a dance, in keeping with my own aspirations and work. 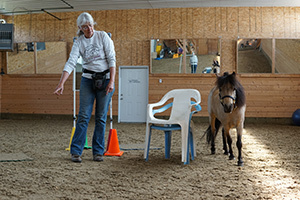 Again Nita and her past training came in handy and her cues and movements that she knew from her dog work meshed beautifully with the body language I already have established through my Equispeak program. While it is still in the early stages it is going very well and is great fun. Here are some pictures that Nita took during one of our sessions. And here is a video link to how to start the sending around an object so you too can start this if you would like to.